Mike Ashley has "no intention of investing significantly" in Newcastle United, according to MP Chi Onwurah. Onwurah, a vocal critic of Ashley, met the club's owner before last weekend's home game against Cardiff City. And the Newcastle Central MP has told The Times about their meeting at St James's Park. United fans, unhappy with a lack of investment, chanted against Ashley throughout the game. 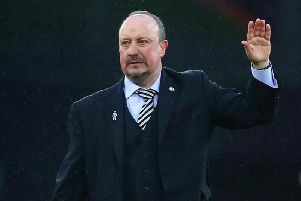 Ashley – who met manager Rafa Benitez for talks after the fixture, which Newcastle won 3-0 to move out of the Premier League's relegation zone – told Onwurah that he felt "misrepresented". “It’s clear he feels very strongly in his own defence, so it’s not a matter of indifference to him that he’s seen as the cause of Newcastle’s malaise as well as seen as undermining the city and asset-stripping the club – that matters to him," said Onwurah. "He and the people around him think he’s the victim of misrepresentation, that he hasn’t taken any money out of the club. “We disagreed strongly. He didn’t convince me. Most worrying, in my view, is that he has no intention of investing significantly into the club. He said to me at one point 'would you put all your money into it?’. "But this isn’t just any company, it’s a huge part of our city. I would have recognised I was buying a cultural asset that required investment. One of his people said ‘but he has invested’. Buying the club wasn’t investment, it was buying something. Giving the club loans isn’t investment. Meanwhile, Benitez, Newcastle's manager, is still waiting for a transfer breakthrough. Benitez wants to sign a No 10, a winger and a left-back in this month's transfer window. If Benitez – who was forced to sell to buy in the summer after refusing to sign a new deal – is not backed in the transfer market, he will leave the club at the end of the season when his contract expires.